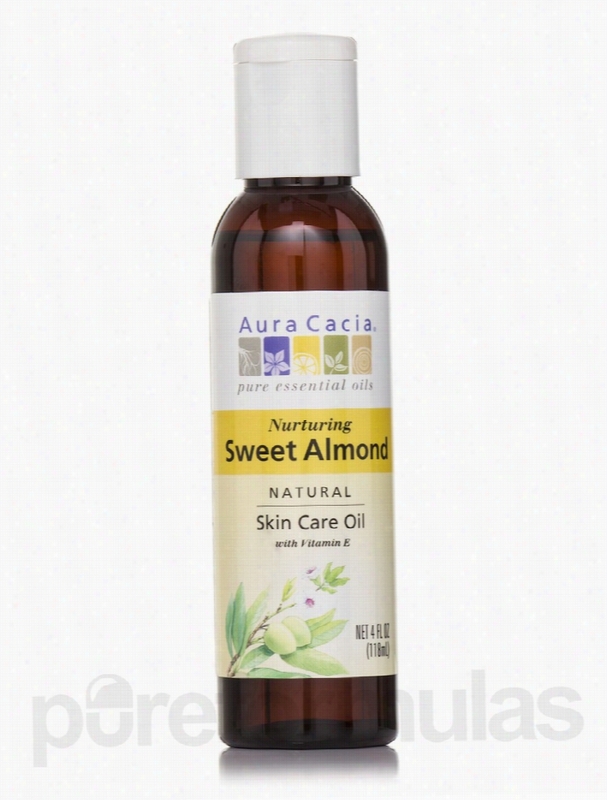 Aura Cacia Skin Care - Sweet Almond Pure Skin Care Oil - 4 fl. oz (118. Sweet Almond Pure Skin Care Oil 4 fl. oz. Sweet Almond Pure Skin Care Oil by Aura Cacia may possibly help relieve muscle pain and physical stress. Nourishes the skin May possibly help relax and refresh the mind and body Sweet Almond Pure Skin Care Oil might potentially help provide a soothing and relaxing effect for the skin. Almond oil is believed to help the skin by making it glow and look healthy. It potentially renews skin cells for fresher and more radiant skin. Vitamin E acetate may possibly help protect the skin from environmental pollution. It may also improve skin texture and moisture. Sweet Almond Pure Skin Care Oil could potentially help lighten dark spots and relieve dry and itching skin. Sweet Almond Pure Skin Care Oil 4 fl. oz. Includes the Following Ingredients: Prunus Amygdalus Dulcis (Sweet Almond) Oil: Could renew skin cells for fresher and more radiant skin. D-Alpha Tocopheryl Acetate (Vitamin E Acetate): May possibly improve skin texture and moisture content. These statements have not been evaluated by the Food and Drug Administration (FDA). These Products are not meant to diagnoseÃ¢ÂÂ treat or cure any disease or medical condition. Please consult your doctor before starting any exercise or nutritional supplement program or before using these or any product during pregnancy or if you have a serious medical condition. 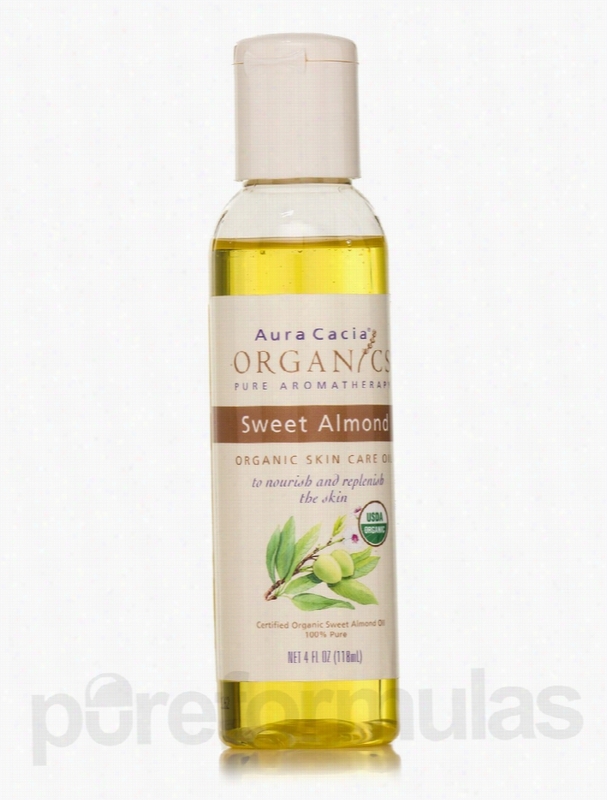 Aura Cacia Skin Care - Organic Sweet Almond Skin Care Oil - 4 fl. oz. Organic Sweet Almond Skin Care Oil is commonly used as massage oil because it provides good lubrication while nourishing the skin. Nourishes skin with vitamins and minerals Keeps skin moisturized Organic Sweet Almond Skin Care Oil can be used after a bath or shower to replenish and retain moisture in the skin. Sweet Almond Oil contains Vitamin E&sbquo; a known antioxidant that slows down skin aging. Sweet Almond Oil is an emollient that increases skin hydration and helps in retaining moisture. Sweet Almond Oil contains vitamins and minerals that help heal damaged skin. Sweet Almond Oil also softens chapped skin. Sweet Almond Oil fights germs that may cause infection and skin irritation. People with dry skin will greatly benefit from the nourishing and moisturizing properties of Organic Sweet Almond Skin Care Oil. Organic Sweet Almond Skin Care Oil 4 fl. oz. Includes the Following Ingredients: Organic Prunus Amygdalus Dulcis (Sweet Almond) Oil: Has vitamins and minerals that nourish the skin These statements have not been evaluated by the Food and Drug Administration (FDA). These products are not meant to diagnoseÃ¢ÂÂ treat or cure any disease or medical condition. Please consult your doctor before starting any exercise or nutritional supplement program or before using these or any product during pregnancy or if you have a serious medical condition. 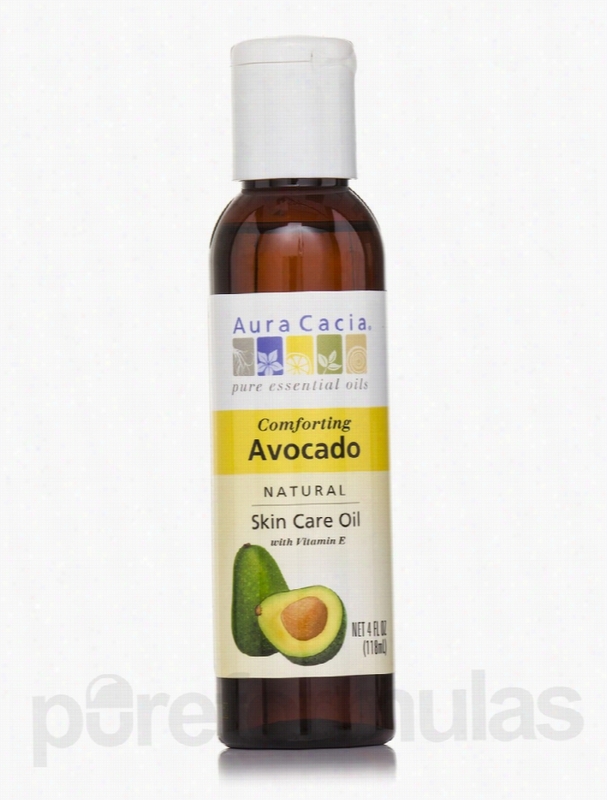 Aura Cacia Skin Care - Comforting Avocado Natural Skin Care Oil with. Avocado Natural Skin Care Oil 4 fl. oz. Avocado Natural Skin Care Oil 4 by Aura Cacia might possibly help support your skin health. It may also be beneficial for sun damaged skin. Might have emollient properties May help reduce wrinkles The combination of ingredients is what might be able to give you great skin benefits. Avocado oil is believed to be high in sterolins&sbquo; which may possibly help reduce age spots. It might also have potential benefits for regenerating and softening the skin. Vitamin E is believed to help prevent water loss and deterioration of cells in the skin. It may possibly help protect cells from environmental oxidative stress and reduce sun-induced skin wrinkles. Vitamin E might also have excellent wound healing properties. Massage with Aura Cacia&rsquo;s Avocado Natural Skin Care Oil for potential soothing skin care. Avocado Natural Skin Care Oil 4 fl. oz. Includes the Following Ingredients: Persea Americana (Avocado) Oil: Is believed to help soften skin. D-Alpha Tocopheryl Acetate (Vitamin E Acetate): Might possibly help moisturize the skin. These statements have not been evaluated by the Food and Drug Administration (FDA). These products are not meant to diagnoseÃ¢ÂÂ treat or cure any disease or medical condition. Please consult your doctor before starting any exercise or Nutritional supplement program or before using these or any product during pregnancy or if you have a serious medical condition. 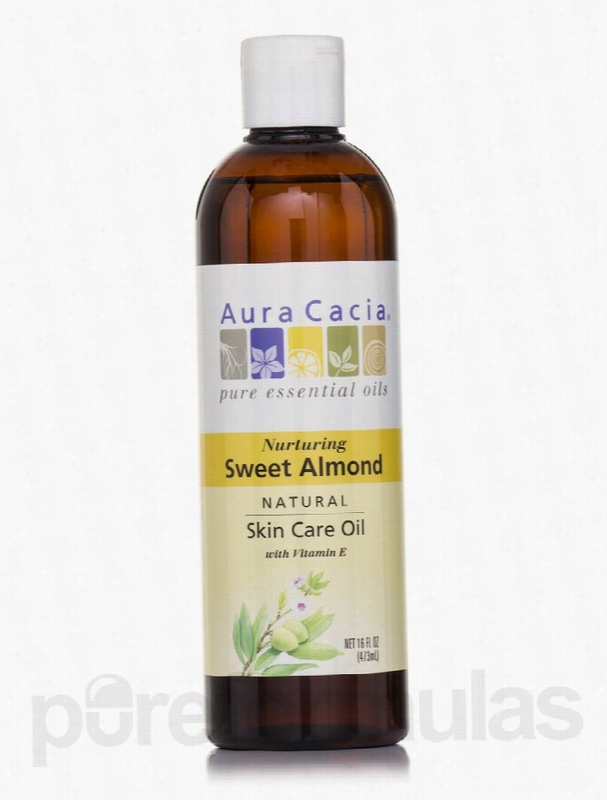 Aura Cacia Skin Care - Sweet Almond Pure Skin Care Oil - 16 fl. oz. Sweet Almond Pure Skin Care Oil 16 fl. oz. Sweet Almond Pure Skin Care Oil nourishes the skin. It may possibly help make it softer and smoother. May promote healthy skin Could relieve muscle pain and tension Sweet Almond Pure Skin Care Oil&sbquo; manufactured by Aura Cacia&sbquo; may possibly help maintain healthy moisture levels in the skin. It could also have potential benefits in relieving physical stress and muscle pain. Sweet almond oil potentially renews the skin cells&sbquo; for fresher and more radiant skin. Sweet Almond oil may possibly provide additional benefits to your skin by preventing blackheads and removing dead skin cells. Vitamin E acetate could improve skin texture and moisture. It may help protect the skin from UV damage. Sweet Almond Pure Skin Care Oil 16 fl. oz. Includes the Following Ingredients: Prunus Amygdalus Dulcis (Sweet Almond) Oil: May renew the skin cells&sbquo; for fresher and more radiant skin. D-Alpha Tocopheryl Acetate (Vitamin E Acetate): Could possibly improve skin texture and moisture. These statements have not been evaluated by the Food and Drug Administration (FDA). These Products are not meant to diagnoseÃ¢ÂÂ treat or cure any disease or medical condition. Please consult your doctor before starting any exercise or nutritional supplement program or before using these or any product during pregnancy or if you have a serious medical condition. 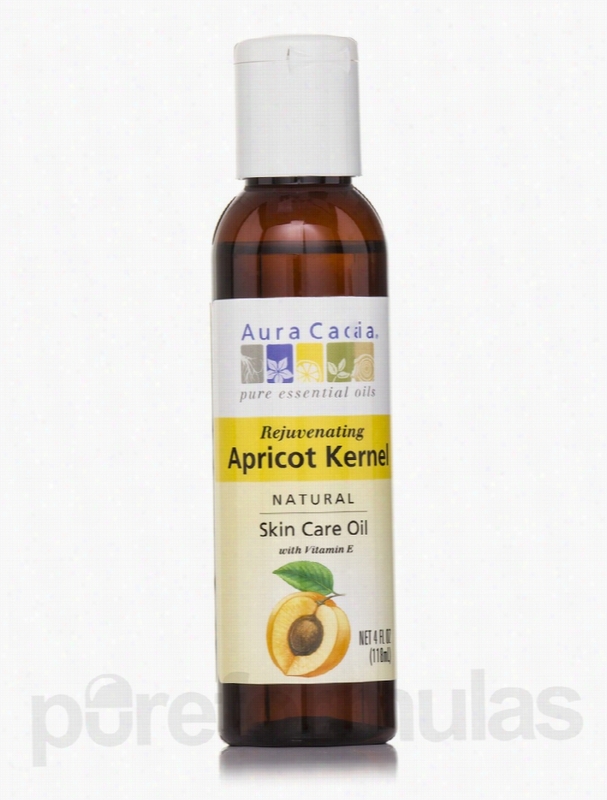 Aura Cacia Skin Care - Apricot Kernel Natural Skin Care Oil with. Apricot Kernel Skin Care Oil 4 fl. oz. Apricot Kernel Skin Care Oil by Aura Cacia may possibly help restore the vitality of the skin. Might nourish the skin May provide skin-supporting benefits Aura Cacia&rsquo;s Apricot Kernel Skin Care Oil has rehydrating properties that might be able to potentially help moisturize any type of skin. Apricot kernel oil may not leave a greasy coat on the skin&mdash;making it ideal to use daily as a moisturizer for your skin. The gamma-linoleic acid content of the oil is what may possibly help firm up your skin. D-alpha tocopheryl acetate is an antioxidant believed to help protect the cells of the skin from harmful pollutants. It&rsquo;s also considered a skin-conditioning agent. Apply Apricot Kernel Skin Care Oil from Aura Cacia after a shower for possible smooth and radiant skin. Apricot Kernel Skin Care Oil 4 fl. oz. Includes the Following Ingredients: Prunus armeniaca (Apricot) Kernel Oil: May possibly help soften the skin. D-Alpha Tocopheryl Acetate (Vitamin E Acetate): Is believed to have antioxidant properties. These statements have not been evaluated by the Food and Drug Administration (FDA). These products are not meant to diagnoseÃ¢ÂÂ treat or cure any disease or medical condition. Please consult your doctor before starting any exercise or nutritional supplement program or before using these or any product during pregnancy or if you have a serious medical condition. 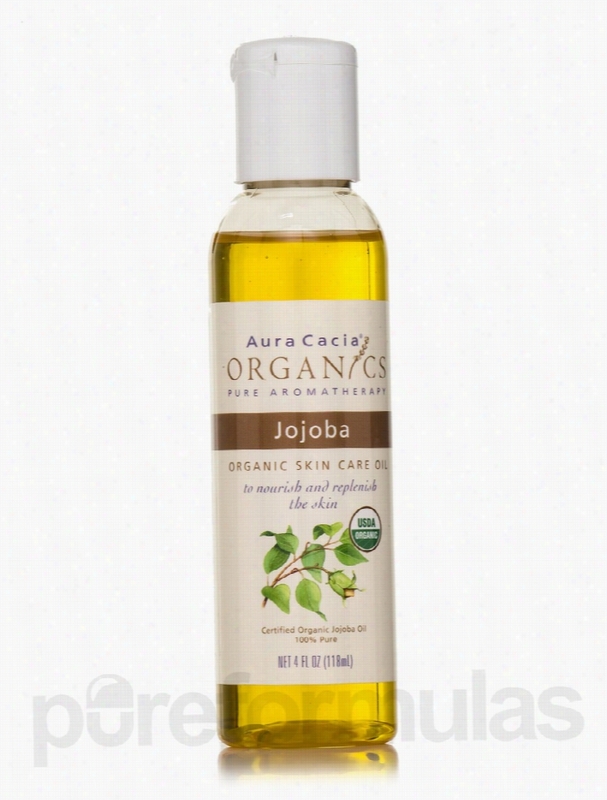 Aura Cacia Skin Care - Organic Jojoba Skin Care Oil - 4 fl. oz (118. Organic Jojoba Skin Care Oil 4 fl. oz. A product of Aura Cacia&sbquo; Organic Jojoba Skin Care Oil might be able to balance the skin&rsquo;s pH levels and maintain its moisture. It&rsquo;s a natural skin protecting and moisturizing product that may possibly help keep your skin soft and nourished. May resemble your skin&rsquo;s natural oil Might possibly help soften the skin Potentially could prevents skin dryness Aura Cacia&rsquo;s Organic Jojoba Skin Care Oil could be an ideal skin softening and moisturizing product for you due to all of its beneficial properties for your skin. Jojoba oil is believed to help by inhibiting growth of fungi. It has fatty acids that may potentially be beneficial to the skin. It&rsquo;s an emollient that might possibly help prevent skin dryness. Jojoba is believed to help relieve the pain of sunburn and soothes many other skin conditions. It may possibly encourage hair re-growth because it might be able to unclog hair follicles. Organic Jojoba Skin Care Oil 4 fl. oz. Includes the Following Ingredient: Jojoba Oil: Is believed to have moisturizing and Antioxidant properties. These statements have not been evaluated by the Food and Drug Administration (FDA). These products are not meant to diagnoseÃ¢ÂÂ treat or cure any disease or medical condition. Please consult your doctor before starting any exercise or nutritional supplement program or before using these or any product during pregnancy or if you have a serious medical condition. Annemarie Borlind Skin Care - Combination Skin Facial Toner. Combination Skin Facial Toner (oily/combination) 5.07 oz (150 ml) from Annemarie Borlind is an oil-free toner that works to keep your skin healthy. This astringent works to refine pores&sbquo; prevent blemishes and brings sebum production to balanced levels. Evidences show that this toner works to refine skin texture&sbquo; restores and maintains elasticity and may protect the skin from harmful free radicals. This toner from Annemarie Borlind consists of green tea that is filled with Antioxidants and may help in the prevention of acne. It is believed that green tea extracts may be the most natural way to keep your skin bright. Vitamin E improves texture and tone of your skin and may help in reducing under-eye circles. A combination skin is typically that skin where the center part of the face is oily and the rest are dry and flaky. 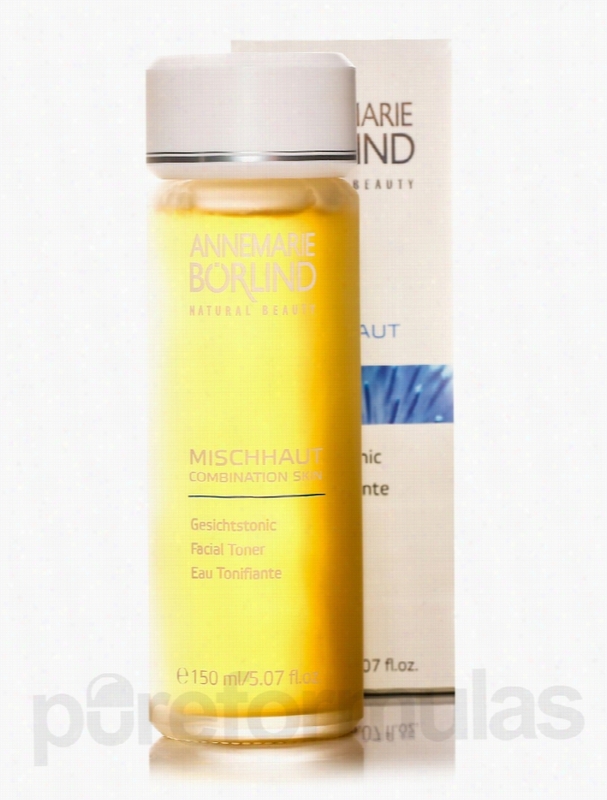 This skin needs special care and this toner from Annemarie Borlind helps take good care of this skin type. The toner helps bring excess sebum production to normal. The algae extracts present helps bind excess oils. Pantanol&sbquo; sorbitol and lecithin present in this toner helps take care of the dry area of your skin by locking moisture. Witch hazel refines skin texture&sbquo; while milk protein complex helps support natural regeneration. Jojoba oil and lecithin restores and maintains skin elasticity. Combination Skin Facial Toner (oily/combination) 5.07 oz (150 ml) from Annemarie Borlind gives you an even matte finish. These statements have not been evaluated by the Food and Drug Administration (FDA). These products are not meant to diagnoseÃ¢ÂÂ treat or cure any disease or medical condition. Please consult your doctor before starting any exercise or nutritional supplement program or before using these or any product during pregnancy or if you have a serious medical condition. 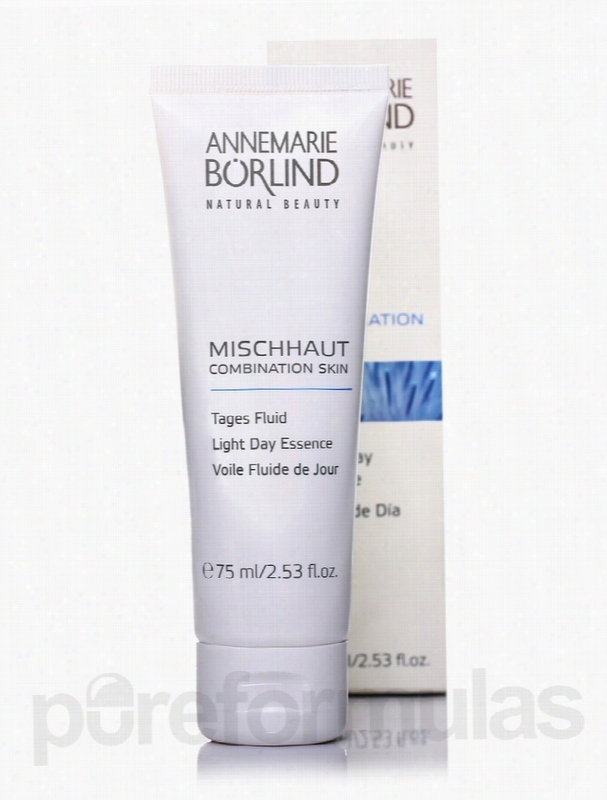 Annemarie Borlind Skin Care - Combination Skin Light Day Essence. Combination Skin Light Day Essence (oily/combination) 2.53 fl. oz (75 ml) from Annemarie Borlind is a light emulsion that is an ideal base for makeup. This day essence cream helps hydrate&sbquo; nourish protect and balance combination skin type. While it works to balance sebum production&sbquo; it gives your face an even matte finish. Combination skin type is one that has oily as well as dry areas. Regular products may not work well with this skin type and you may need special care such as this cream from Annemarie Borlind. The algae extracts present in this product helps bind excess skin oil and helps normalize the production of sebum. With all natural ingredients and no harsh chemicals&sbquo; this product may be ideal for daily skin care. Green Tea and Vitamin E extracts protect skin from free radical damage. Green tea may further help keep your skin bright and blemish free. Witch Hazel extracts present in this cream helps refine skin texture&sbquo; while lecithin and jojoba oil maintains and restores elasticity. The milk protein complex present in this product helps in natural regeneration process and protects skin against forming blemishes. The dry area of your combination skin is well taken care of by pantanol and sorbitol that binds moisture. Gift your skin the goodness of Combination Skin Light Day Essence (oily/combination) 2.53 fl. oz (75 ml) from Annemarie Borlind. These statements have not been evaluated by the Food and Drug Administration (FDA). These products are not meant to diagnoseÃ¢ÂÂ treat or cure any disease or medical condition. Please consult your doctor before starting any exercise or nutritional supplement program or before using these or any product during pregnancy or if you have a serious medical condition. 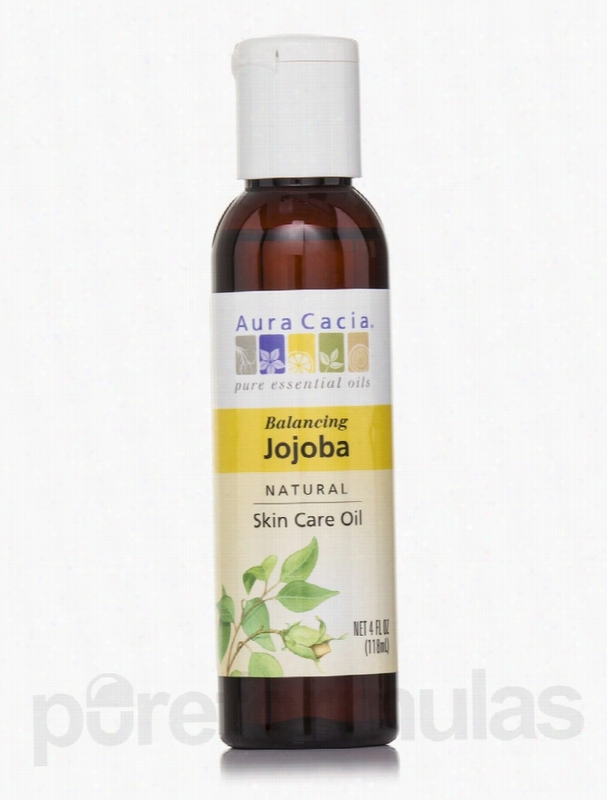 Aura Cacia Skin Care - Jojoba Natural Skin Care Oil - 4 fl. oz (118. Jojoba Pure Skin Care Oil 4 fl. oz. Jojoba Pure Skin Care Oil is manufactured by Aura Cacia tohelp with your personal appearance in regards to wrinkles. Minimizes the size of pores Facial cleanser Jojoba Pure Skin Care Oil aids in regenerating skin cells. Skin cell regeneration creates a new outer layer of cells on the skin's surface and reduces the formation of wrinkles. Simmondsia Chinensis (Jojoba) Oil supports the circulation of the blood in the body to supply the cells with oxygen. Jojoba Oil helps prevent flakiness and itchy scalp. Jojoba Oil has antibacterial properties&sbquo; which can reduce swelling and fight harmful microorganisms. Jojoba Pure Skin Care Oil moisturizes smooth&sbquo; healthy skin. Jojoba Pure Skin Care Oil 4 fl. oz. Includes the Following Ingredients: Simmondsia Chinensis (Jojoba) Oil: Soothes skin and unclogs hair follicles These statements have not been evaluated by the Food and Drug Administration (FDA). These Products are not meant to diagnoseÃ¢ÂÂ treat or cure any disease or medical condition. Please consult your doctor before starting any exercise or nutritional supplement program or before using these or any product during pregnancy or if you have a serious medical condition. 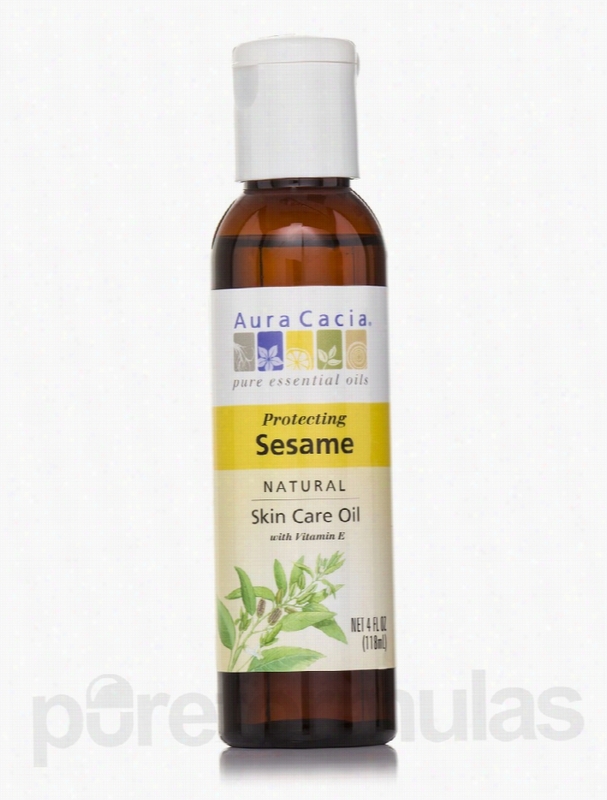 Aura Cacia Skin Care - Sesame Skin Care Oil - 4 fl. oz (118 ml). Sesame Skin Care Oil 4 fl. oz. Sesame Skin Care Oil by Aura Cacia may possibly help improve circulation and repair damaged skin cells&sbquo; all while providing your skin with a healthy glow. May nourish the skin Might be able to ease cracked heels&sbquo; dry knees&sbquo; and elbows Sesame Skin Care Oil might possibly help trap moisture&sbquo; keeping skin moisturized throughout the day. Its two ingredients are what make this oil so beneficial for the skin. Sesame oil may be used as a regular Moisturizer or possibly as a sunscreen too. It&rsquo;s believed to help relieve cracked heels&sbquo; and extremely dry knees and elbows. Vitamin E Acetate may potentially provide protection for the skin from UV damage. Use Aura Cacia&rsquo;s Sesame Skin Care Oil as it may help make your skin feel smooth and supple. Sesame Skin Care Oil 4 fl. oz. Includes the Following Ingredients: Sesamum indicum (Sesame) Oil: Is believed to help prevent dry skin problems. D-Alpha Tocopheryl Acetate (Vitamin E Acetate): May possibly help protect the skin from UV damage. These statements have not been evaluated by the Food and Drug Administration (FDA). These products are not meant to diagnoseÃ¢ÂÂ treat or cure any disease or medical condition. Please consult your doctor before starting any exercise or nutritional supplement program or before using these or any product during pregnancy or if you have a serious medical condition.